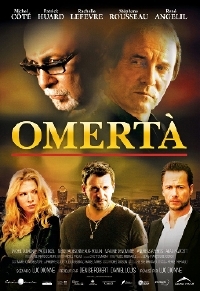 With Quebec in the middle of one largest mafia scandals ever to rock the province, it comes as no surprise that Omerta, a story about a group of individuals involved in shady dealings and others with questionable ties, is one of Canada's biggest blockbusters, right behind Resident Evil: Retribution; this in spite of the fact that until it's Whistler debut, it had not played outside of the province. Adapted by Luc Dionne from his hugely successful miniseries, Omerta introduces an almost entire new set of characters in the French Canadian mafia. Patrick Huard, one of Canada's biggest stars (you may remember him from last year's crowd pleasing Starbuck (review)), sheds comedy for a turn as Steve, the manager of a high end Italian restaurant that is also a front for the mafia's gold smuggling operation. His restaurant is often the meeting place for mafia bosses including the big wig himself Dominic Fagazi, played by Rene Angelil making, what is essentially, his big screen debut. Sophie (Rachelle Lefevre) is a cop who has been brought on to infiltrate the mob but her handler, Michel Cote also stepping away from comedy for a role as her tough nosed boss Pierre, isn't in the know about other operations already in progress targeting the same individuals, something which will prove problematic later. The last man in the mix is Sam Cohen, a recently released convict who appears to be at the centre of the gold smuggling operation. Sophie's job is to get close to him and, through her womanly ways, figure out what the mob is up to but as is always the case, the mob knows more than the cops do and it all plays out with devastating, if somewhat bland, resutls. Omerta has all the makings of a good mob movie but it lacks certain key elements. First and foremost is the fact that as good as these actors are individually, they're mostly a wash out here. The exceptions are Huard who easily navigates the hierarchy of organized crime and Stephane Rousseau as Sam Cohen, the bad guy who seems capable of anything. Omerta's other hurdlem and arguably the one which causes the most damage, is its ridiculously long set up. With so many different players, the introduction of characters and setup of the story takes nearly an hour and it significantly messes with the film's pacing. The second half of the movie is fantastic, far more compelling and dynamic than the first hour, but getting there is such a slog that it loses punch and overall Omerta feels like a bloated, overlong drama. It's not without merit and when it does eventually find its step Omerta is exciting but the script really needed a rework from someone far removed from the material, someone who could look at the big picture and trim off the fat that plagues the first half. As it stands Omerta is an interesting but infuriating and ultimately unsatisfying movie that doesn't quite hit the mark. Hopefully someone else will take a stab at making a great Canadian mob movie. The parts are all here, they just need a little help.